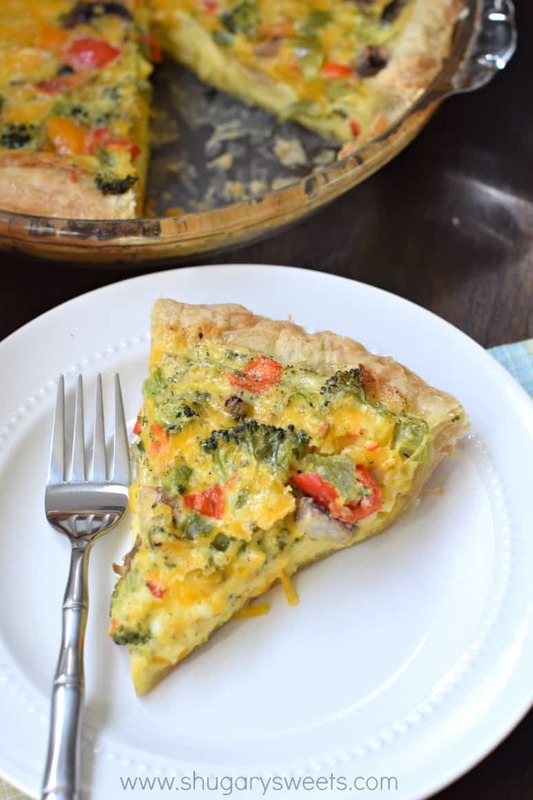 The buttery puff pastry is the perfect crust to this Veggie Quiche! Serve one for brunch or make it for dinner! Mother’s Day is around the corner. I’m curious, what kind of traditions do you have in your family? Around here we start the day by going to church, and usually end up going out for brunch afterwards. Dinner is typically not as important, as we have usually spent the day cleaning the yard and gardening, so we tend to fend and make salad or sandwiches. In the midwest, Mother’s Day is the well known “safe” date to start planting gardens! Threats of frost are now in our past. Admittedly, I am really going to miss my gardens this year. Since moving from Ohio back to Illinois, the property we live on just isn’t garden friendly. We have big beautiful mature trees, that seem to offer a wonderful shade to our yard, yet not enough sunlight for a garden to thrive. Back in Ohio, I had a huge strawberry patch, raspberries, and three raised beds filled with vegetables and herbs! While I am going to miss all the fruits of the soil, tending to those huge gardens was a daily chore. This first year I may enjoy the time not spent raking, weeding, etc….yet I will for sure miss all the vegetables that my gardens gave us. Vegetables that would be perfect in today’s quiche! Normally when I make a big quiche I use a pie crust. And meat. We love a sausage and spinach combo! But after making some delicious mini quiche with puff pastry a few weeks ago, I received several messages wondering if those mini quiche can be made into a larger quiche. The answer is YES. And you can use any fillings you desire. Whether you love meat or just veggies…or even a combo of both, fill it up! I used a combo of broccoli, peppers, and mushroom in today’s recipe. It turned out delicious. I think I know what I’m requesting for brunch on Mother’s Day. Allow frozen puff pastry to thaw, according to package directions. Once thawed, press into a 9-inch pie plate. Beat eggs, heavy cream, milk, garlic, pepper, parsley and onion flakes until fully combined. Add in cheeses and vegetables. Pour into pie plate. Bake in a 375 degree oven for 30-35 minutes. Remove and allow to cool 10-15 minutes before slicing and serving. ENJOY. 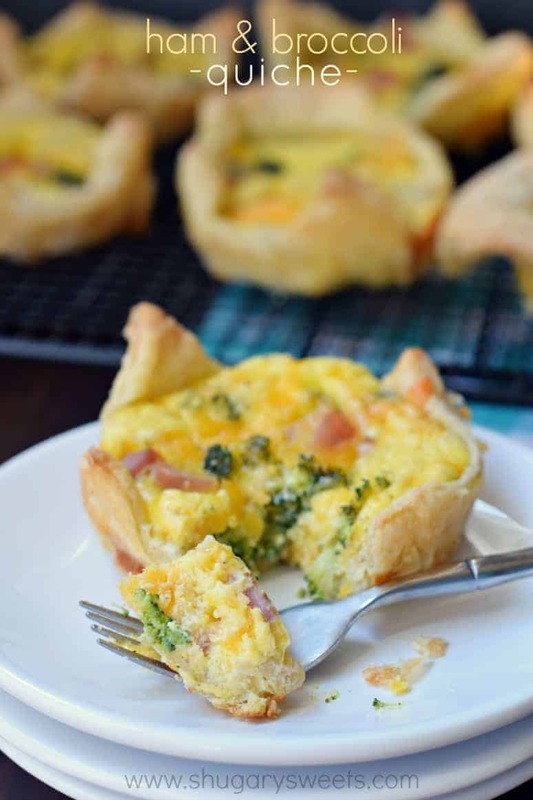 Broccoli and Ham mini quiche. Great way to use up leftover ham! 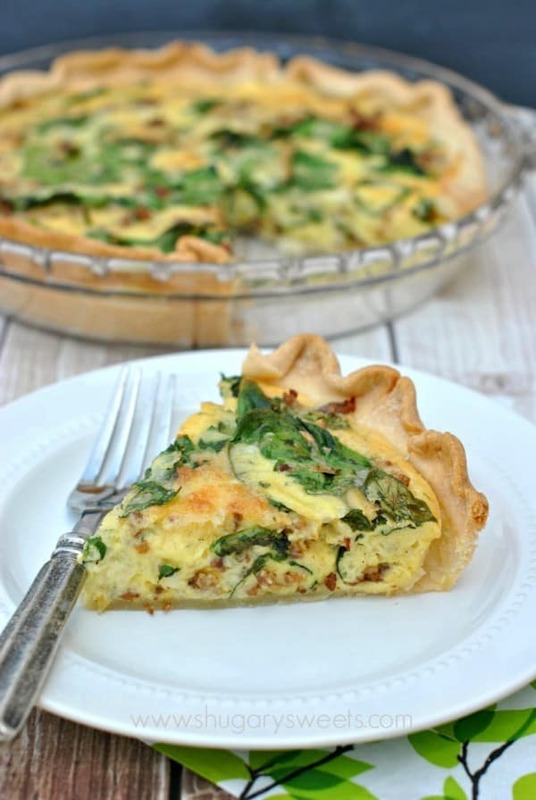 Sausage and Spinach Quiche with a buttery pie crust! 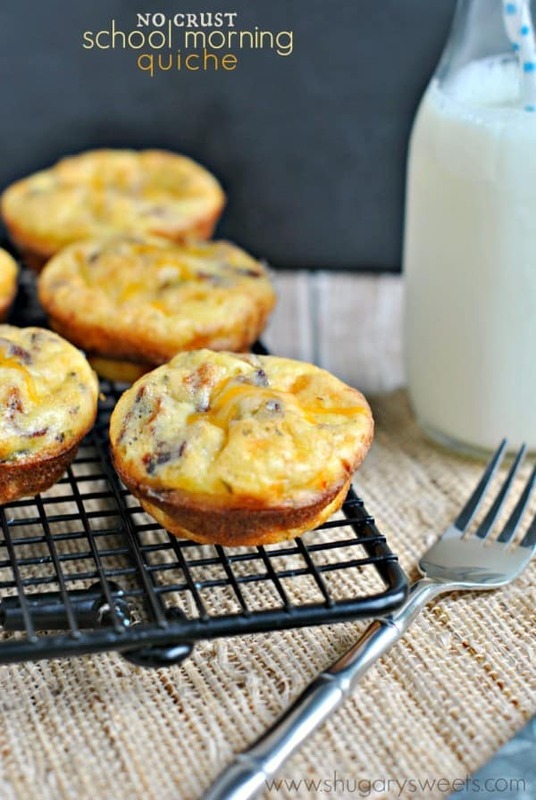 School Morning Quiche: these crustless grab and go quiche are perfect for busy mornings. Freeze well too! Oh, Aimee–I want this so badly for Mother’s Day. It looks perfect! What a beautiful quiche! Loving all those veggies in there! We do have a great farmers market! Of course it’s not the same, but it works for now! 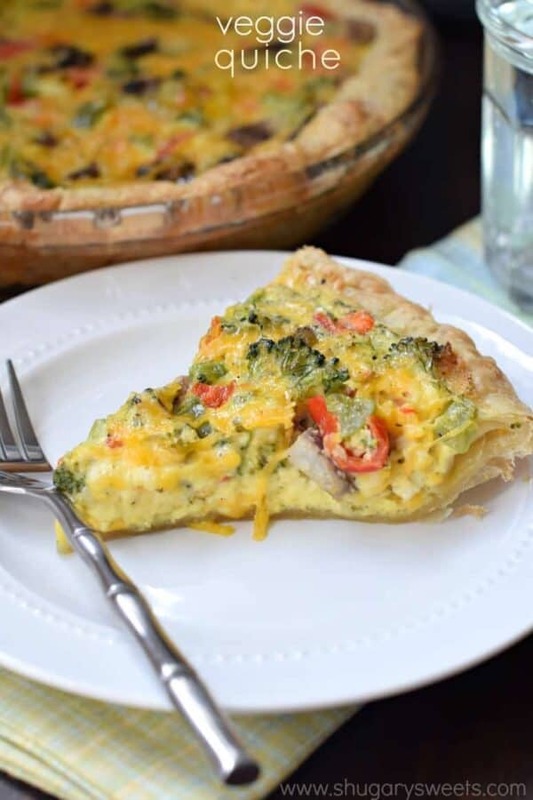 Veggie quiche is one of my all-time favorites! I’ll eat it for brunch or lunch or dinner. Or all three! How can you argue with pie crust? This one looks especially good. I’m glad it’s finally warm enough in the Midwest to garden! I don’t make quiche enough! It needs to change because this just made me very hungry! Pinned! 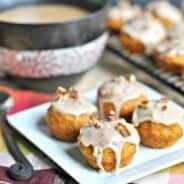 See this recipe makes me wish my boyfriend ate eggs. It is so pretty! I was never an egg eater…until about a year ago. There’s hope for him yet! Oh my gosh, I love this so much. I have such a weakness for puff pastry! Quiche is always a good idea!! This one is beautiful! So perfect for Mother’s Day brunch! Love that you used puff pastry for the crust! I’m making this for my Mother on Mothers Day! Thanks for sharing it. This quiche looks amazing. I’m planning my garden as we speak. I can’t wait for fresh veggies. I LOVE quiche. Like love-love it. And this looks amazing! Yay for warm weather for you guys, but boo for warm weather for us (it gets to 115 here in lil palm springs, ca) This quiche looks delicious. I’ve always wanted to make a quiche, but don’t like the pie crust aspect. This changes everything for me. Whoo Hoo! Oooh quiches are my weakness!!! 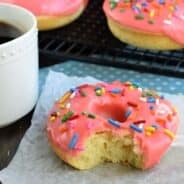 This look so good Aimee – I am SO hungry right now! This is the first year I’ve lived back near my family in 8 years, so I’ll be looking forward to making brunch for my mom on Mother’s Day. I love this loaded quiche. Looks perfect for Mother’s Day and every other day too! We always do brunch for Mother’s Day too! Sometimes we make it homemade, but most of the time we drive over an hour to our favorite brunch restaurant. 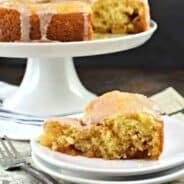 They have the BEST blueberry coffee cake I’ve ever tasted with the most addictive cinnamon streusel! 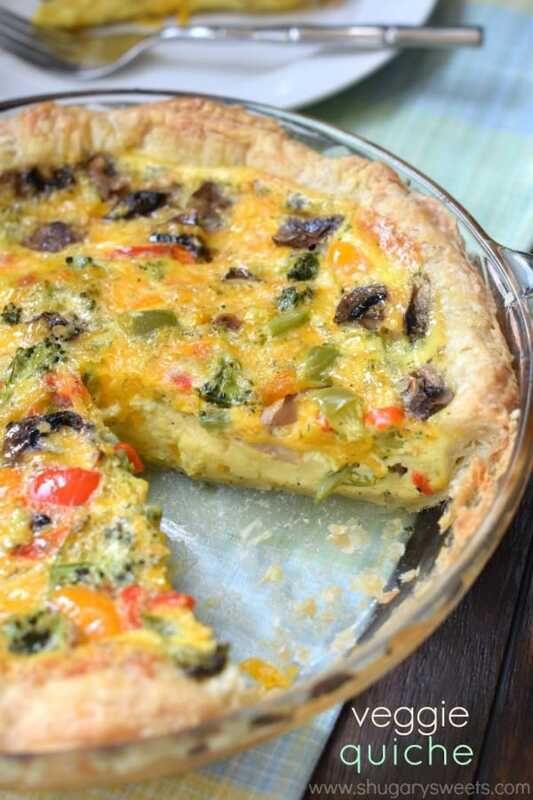 But of course, we always load up on eggs and veggies before diving into that… Like your gorgeous quiche! 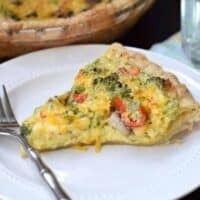 Has anyone tried to prepare this quiche and freeze it ?